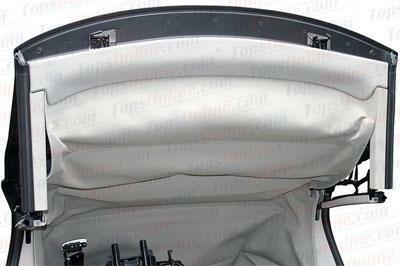 This convertible top for the Saab 9-3 & 9-3 Aero, Arc & Linear fits the 2004, 2005, 2006, 2007, 2008, 2009, 2010 and 2011 model years. Made with original Saab Twill foam backed Cloth material. Available only in original Saab Grey Twill material. You can re-use your existing Headliner if it is in good shape. Hi!!! My name is Jan L. and i live in Sweden... I just want to express my satisfaction with my new top that i bought from your company... The car is a 1963 Chrysler Imperial Convertible and i bought the top a year ago, the 13th of Apr 05... The fit is perfect and the material seems to be of very good quality... Thanks and brgds.